Pressure cookers are a low-energy, high-flavor, healthy way of cooking that will save you both time and money. Popular during the Depression and with past generations, pressure cookers are regaining their place in the kitchen. Even better, modern pressure cookers are far easier and safer to use than their older counterparts. Cooking foods under pressure can certainly be daunting if you’re new to the cooking technique. However, if you follow these pressure cooking tips, you’ll quickly master the art and great taste of pressure cooking. A pressure cooker is typically a pot with a tight-locking lid that is placed on the stove over heat, which raises the pressure in the pot and cooks food faster than other methods. Pressure builds up because the locking lid prevents steam and liquids from escaping. Water typically boils at 100 degrees C (212 degrees F), but raises to about 121 degrees C (250 degrees F) in a pressure cooker. This raise in temperature shortens cooking time by up to 70 percent. Pressure cooking means less time (and heat) in the kitchen, lower energy costs, and healthy meals in minutes (pressure cooking results in foods retaining more vitamins and minerals). And, if you’ve been hesitant to use a pressure cooker because they have been known to explode, understand that the newer models are better made and have safety mechanisms to prevent such an event. Pressure cookers range from 3.5 quart to 12 quart capacity, with the larger pressure cookers doubling as vessels for pressure canning. Pressure cookers are made of aluminum or stainless steel. The stainless steel is typically of higher quality. Different models have different lids, valves, and locking systems, so it’s important to read the instruction manual before using, even if you’re a pressure cooking pro. Traditional pressure cookers are placed over a burner on the stove, but you also can find electric pressure cookers that simply need to be plugged into an outlet. 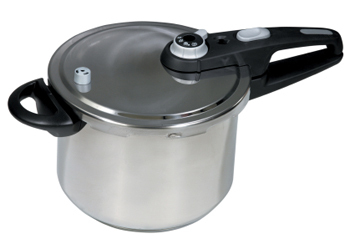 Pressure cookers range in price from $50 to $250 depending on size, material, and manufacturer. This is especially important if you’ve never used a pressure cooker before. Watching your grandma do it when you were a kid does not count. Take the time to learn about your particular model so you can use it correctly and safely. To master pressure cooking, rely on tested recipes from pressure cooker cookbooks, trusted food websites, and recipes that come with your model. Once you experience pressure cooking using published recipes, you can start creating your own. If you need to feed a family of six, don’t buy the smallest pressure cooker with the idea it will be sufficient for main course meals. Fill pressure cooker to fill line; usually half way with solid foods and two-thirds full for liquids. Foods expand when cooking. In addition, you won’t need as much liquid in pressure cooking because the steam and liquid do not escape from inside the vessel. Though it’s easier to just toss a combination of ingredients into the pot, seal, and pressure cook, you’ll get the best results if you add foods according to cook time if they vary greatly. For example, mushrooms are going to cook faster than sweet potatoes; cook sweet potatoes for a few minutes then add the mushrooms. To bring out the best flavors in your ingredients, sear foods such as onions and meats in the pressure cooker before adding other ingredients and sealing.